Sleep allows the baby to recover, grow and develop its brain . A baby sleeps a lot during the first months of its life. It spends more time asleep than awake, but this time gradually shortens with waking time taking precedence. Birth: approximately 8 - 18 hours per day. 1 to 3 months: 7 - 18 hours per day. 4 to 5 months: 5 to 16 hours per day: during this period the patterns of sleep become a little more stable. 6 to 8 months: 4 to 15 hours per day. 9 to 12 months: 3 to 14 hours per day. From birth to 6 months: 3 naps are often necessary: one at the end of the morning and two in afternoon. 9 months to 1 year: generally the nap at the end of the afternoon is enough, with no more necessary. Do not let the baby sleep completely in the dark either during the day or night. Babies have difficulty in differentiating between day and night until the age of 3 to 4 months. Placing a night light in its room during the night time would be advised. Do not rush your baby to sleep: explain the baby it is going to sleep, so it gradually gets used to the idea. Do not stimulate your baby which might excite and irritate it before going to sleep. Be patient, allow time for your baby to fall asleep babies do not sleep on demand, they need a few moments to settle and drift off to sleep. Avoid changing the cot's position. Keep the furniture in its room in the same position helping with familiarity and a routine. Avoid checking your baby every fifteen minutes to see if it has fallen asleep, opening doors and noise can disturb it causing the baby to wake. Do not go immediately into its room as soon as it cries. Wait for a few moments in order to see if it settles and falls back to sleep. Babies often cry for a few moments during its sleep and quickly fall back to sleep again. As a parent you quickly learn how to recognise these cries and those requiring more attention. A baby sometimes wakes up to 8 times per night: these mini wake ups last a few minutes, from approximately 1 to 10 minutes. These babies may cry and grunt and are able to sleep alone, so avoid intervening each time as babies sometime struggle to fall asleep alone. Avoid loud noises at home and brights lights in its room: they can both startle and upset your sleeping baby. Avoid sedative syrups without medical advice and do not punish it by putting it to bed. The World Health Organisation (WHO)'s advice is for the baby to sleep in the parents' room for the first 6 months. These are guidelines which support the prevention of cot death. Doctors usually advise that babies sleep in their own room after 6 months to avoid sleep disturbances and behavioural changes. 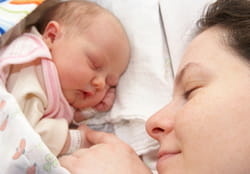 Babies whose mothers were very stressed or depressed during their pregnancy may have difficulties with sleeping or find it difficult to fall asleep. It is vital to lay the baby down on its back since the belly position increases the risk of sudden death syndrome: Positioned on its back the baby's face is free and it can breath without constraint. Do not add cloths, covers, feather beds or pillows because of the risk of suffocation. The temperature of the room should not exceed 18 to 20 degrees: Many parents think that a warm room will benefit their child's health: because of this myth some children may develop allergies caused by dustmites (eczema, bronchiolitis, asthma, rhinopharyngitis...). Indeed, dustmites multiply more when the temperature of the room is high. Choose a cot with cot sides, a firm mattress designed for that cot and is the appropriate size for your baby. Latest update on June 22, 2010 at 03:16 PM by Janey39. This document, titled "The baby's sleep," is available under the Creative Commons license. Any copy, reuse, or modification of the content should be sufficiently credited to CCM Health (health.ccm.net).